Maybe it's just me but I think it's a shame to see Broadway in a Verdi opera. The Met is not going on the right path, IMO. Broadway? There's nothing Broadway musical theater-ish about this production. You want Broadway, look at the dances of any number of old Zeffirelli productions still being performed at the Met. Kindly stay on topic, folks, thanks. I'll be seeing this next Thursday, and I think I will like it. I listened to the broadcast last night, and have no quarrel with any of the singers, except I always dislike Oscar, but I know others appreciate the notes. The videos on the Met sight are appealing, and I'm looking forward to this. I'm very excited to see this, though I do miss Mattil (I know she's wrong for it but I just love her!) and I think Blythe would be superior as Ulrica. Are you going to see her in it? and stupid" productions that replace the previous ones. it to the list! the same goes for the "new" Rigoletto and Parsifal. Thank you Zerbinetta for a finely detailed review. Sounds like anonymous also wrote the review on Parterre. I recently saw David Alden's Maometto II in Santa Fe. It, too, was very very clean (as you describe this production and taut (a good word also for Maometto II). I've seen a few of Mr. Alden's European operas on video, and since seeing Maometto and reading your description, it seems appropriate to tag this production with "David Alden does opera in the U.S."
Sorry for all the deleted comments (and my typos above, I was commenting from my phone), Alden seems to have summoned the trolls! Hint: personal attacks (whether towards me, any Alden, or anyone else) and giant rhetorical questions about the nature of musical expression do not make constructive conversation. Comment No. 10, there is a very big difference between David Alden, who has been an internationally acclaimed opera director for decades, and the director for Rigoletto, who is an entirely unproven quantity. The difference between this thoroughly competent and well-conceived production and the embarrassingly inept efforts of opera novices such as Des McAnuff is an argument for hiring experienced, major talents like Alden. And if you can't see anything differentiating this production (which I gather you have not yet seen, and I bet you haven't seen Rigoletto either, considering that it hasn't premiered yet) and, say, Faust, I suggest you need to try to just get over your apparent distaste for modernized visuals and think about the story and music for a minute. 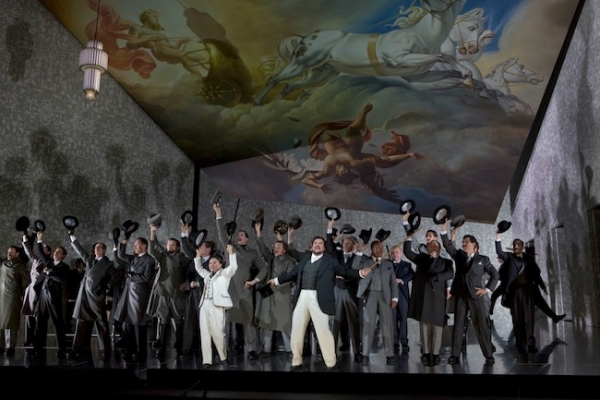 With all due respect to all prior participants in the Met's last Ballo production, I don't remember a damn thing from that performance except Hvoro's unfortunate cape incident, so I would consider that production to be pretty broken. Just got home from the Ballo. I'm sorry but I have to disagree with your review. I don't find the production contributes anything to the music. It all seemed very obvious, the angular rooms, the crazyness of the Tom character. It all seemed very superficial. Another spare deconstructed Euro-production. On the other hand, Radvanovsky and Hvorostovsky were brilliant, Alvarez was great, and I spent the evening trying to figure out whether Keith Miller's cane was a prop or he really hurt his leg. His voice was healthy though. I have never much liked this opera musically, and your comments really nail why – yeah, some beautiful numbers, but it just does not hold together very well. Oscar belongs right up there with the Fiakermilli on the annoyance scale, imo. I've been interested to see who liked and who didn't like the production; almost all of the other reviewers I've read like it much less than you or outright dislike it. This makes me want to see it! Not sure I will be able to get to the broadcast, however. Having seen the production in HD I can only say that one must, MUST, close one's eyes to get the true beauty of Verdi's masterpiece. Actually, it wasn't the sets that bothered me so much, I happen to be a big fan of greys and silvers and like natty pinstripe suits and fancy gowns and the like, but the nutty ideas expressed were simply too much for this feeble brain. Why all the cigarette smoking without once taking a puff or blowing smoke out of one's mouth? Stupid, stupid, stupid. And what was that Sam doing when he lifted Amelia's scarf from the ground and decided to have a private smell contest with it? I was ready to throw up from that one. And why was it necessary to have Oscar sport these huge strange white wings? Don't tell me, I really don't want to hear the symbolism, thanks. And whose idea was it to have the King act like some kind of buffoon instead of the dignified head of a country?